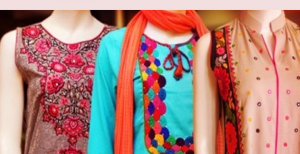 Maria B. a renowned name in Pakistan Leading fashion brands. This is a pure woman brand dealing with clothing and other accessories for women and young girls. 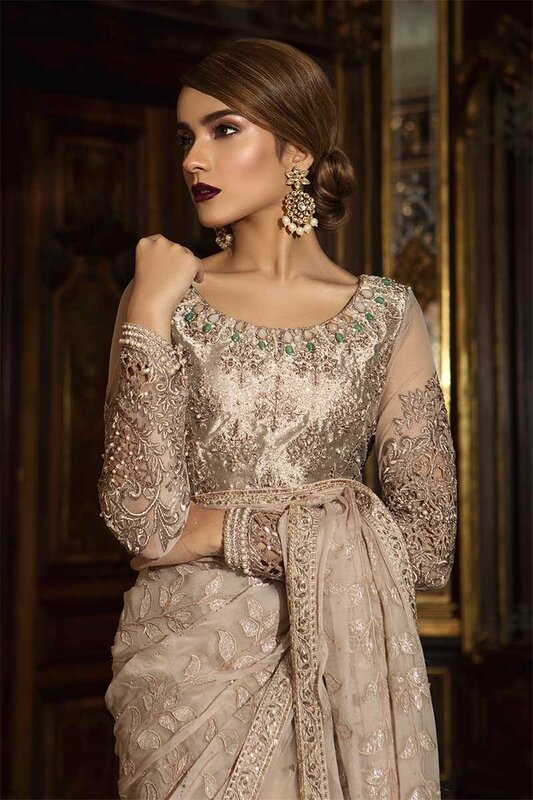 Now it going to present Maria B Latest Formal Wedding Dresses Collection 2019-2020 which deals with very fine clothes in net, organza, Chinese chiffon, jamavar, silk, etc. The suits are decorated ith fine embroideries and detail patterns. Swarovski elements are also included in this collection which comes with each dress. This assortment has been released and the suits are selling like hot cakes. Each and every lady love this wedding edition and buying the suits for their formal events. 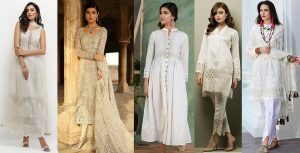 This collection is a formal wear wedding edition loaded with fancy attires which are best for formal parties, wedding ceremonies, and gatherings. This time Maria B uses the unique trends to mix up the trendy and formal culture into these type of designs. 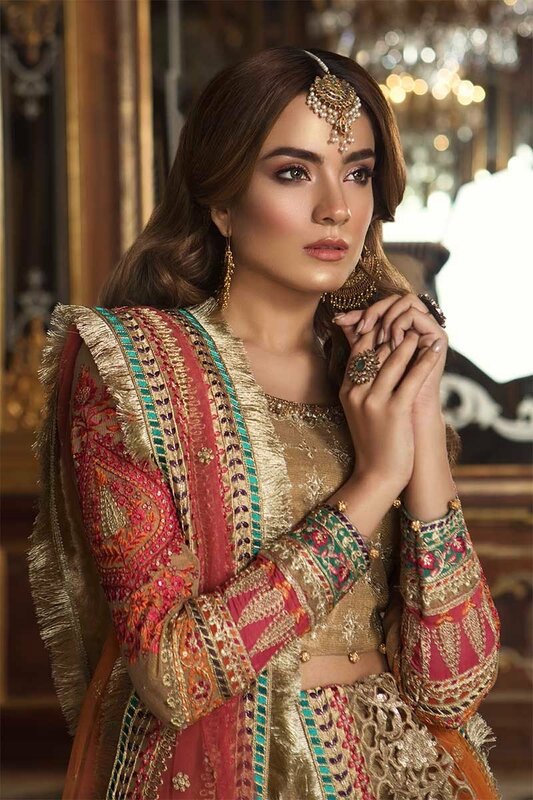 The embroidered collection has beautiful designs on chiffon, thread embroideries at neck, bottom, sleeves, and front of silk shirts. This Latest Formal Wedding Dresses Collection is now available at all leading outlets and stores nationwide. You may shop it online through the official site. So are you ready to grab the wonderful Breathtaking combinations of pristine pastels, bright festive combos, and earthly elegance? Enjoy your season with these chic embroideries and fascinating series of formal wedding dresses. Net, Silk, and Chiffon are known to be a fancy and suitable stuff for fabulous embroidery and Maria B has selected these type of materials in this assortment. The designer has made use of glowing shades and bright colors contrasted with light hues to set up a perfect match of shirts with trousers and churidar pajama. The series include the adorable off white saree which is all love. Other than this black lehenga choli is also included with red dupatta. Ferozi angarkha short frock with two-tones dyed dupatta is a must have for mehndi and mayun functions. Hot red attire is perfect for dinner and evening parties. 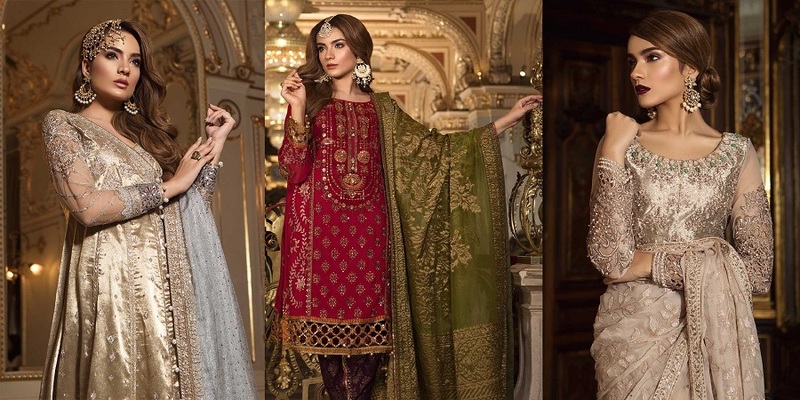 All these attires would be a perfect choice for evening, wedding and party wear. Have a look on Latest Formal Wedding Dresses by Maria B posted below and get inspired. Go and update your formal wardrobe.